With only a set of scales for inspiration, you may think it isn't possible to come up with ideas for unique Libra tattoos. However, there really are ways to create memorable tats for this horoscope sign. Find plenty of inspiration right here. Every zodiac sign has a tale or myth that goes along with it's origin. These stories were used to assign a name to each of the twelve constellations involved. These myths also offer clues about the influence each sign imparts to those who bear it. The story behind Libra is an interesting one, and supplies a number of ideas you can turn into fantastic and unique Libra tattoos. Venus is Libra's ruling planet. 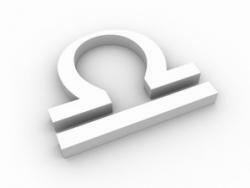 Although Venus also rules Taurus, both signs are very different under their influence of their ruler. Venus of Libra has warrior traits, and often represents the beautiful, the true and the good. Based on the tale above, there are endless ideas to use for truly unique Libra tattoos. Here are just a few to inspire you. Drawing on the justice theme, you might consider a tattoo design based on the glyph symbol also used to represent this zodiac sign, shown at the right. If you're really committed to a major tattoo design dedicated to this zodiac sign, consider creating a full back mural depicting one or more scenes from the traits above. Any of these suggestions are probably more fitting as a man's tattoo. However, if you're the warrior woman type, feel free to use any of the ideas below. You could have an awesome image of Cronus swallowing a baby as a horrified Rhea looks on helplessly. Yes, it is disturbing imagery, but it is part of the tale and represents the origin of Libra. You might choose to show Cronus swallowing the stone as Rhea hides nearby with baby Zeus wrapped tightly in her arms. A battle scene depicting Cronus (Saturn) defeating Uranus would also make an exciting tattoo. In some versions of the tale, Cronus actually cuts off Uranus' testicles and throws them into the water. The new goddess Aphrodite springs forth from the water freshly born. This would make a fantastic full back tattoo mural. Whichever part of the story you might decide to draw inspiration from is sure to become a very dramatic piece of body art. Of course, if the scale imagery appeals to you, there's no reason you can't use it to create a unique tattoo. The scale is strongly associated with the concept of justice. Which two items would you place on the scales to weigh against each other? Love against money? Beauty against character? Peace against war? How you choose to depict each of these ideals is what will make your Libra tattoo truly unique.